For the vast majority of New York City’s inhabitants, Sept. 24, 2011 was a typical Saturday in early autumn. The morning air was muggy, and although the overcast sky seemed pregnant with the possibility of rain, people thronged the streets north of Chinatown on the Lower East Side of Manhattan, browsing at the local fishmongers’ displays, watching their children play soccer in the park, or simply out enjoying a stroll while the weather was tolerable. However, for nearly 300 fans of the cartoon series “My Little Pony: Friendship is Magic,” this congested but charming urban neighborhood was the place to be, a gleaming Jerusalem at the end of a pilgrimage that had drawn some of them from as far away as California. 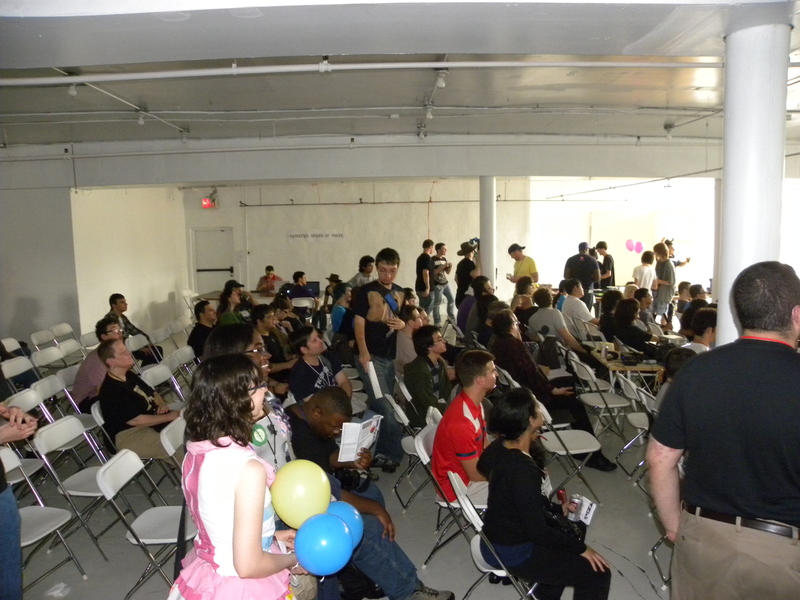 This was the location of BroNY Con, a much-anticipated gathering of Bronies hosted by Purple Tinker and her New York City area Meetup group. For the pony fans streaming out of the subway station at Grand Street, that Saturday promised an experience like no other: a chance to geek out with fellow Bronies, shop for custom-made fan art, and meet the show’s supervising director, Jayson Thiessen, who had flown in from Vancouver to host a screening and a Q&A. In the words of Rainbow Dash, it was going to be SO AWESOME! 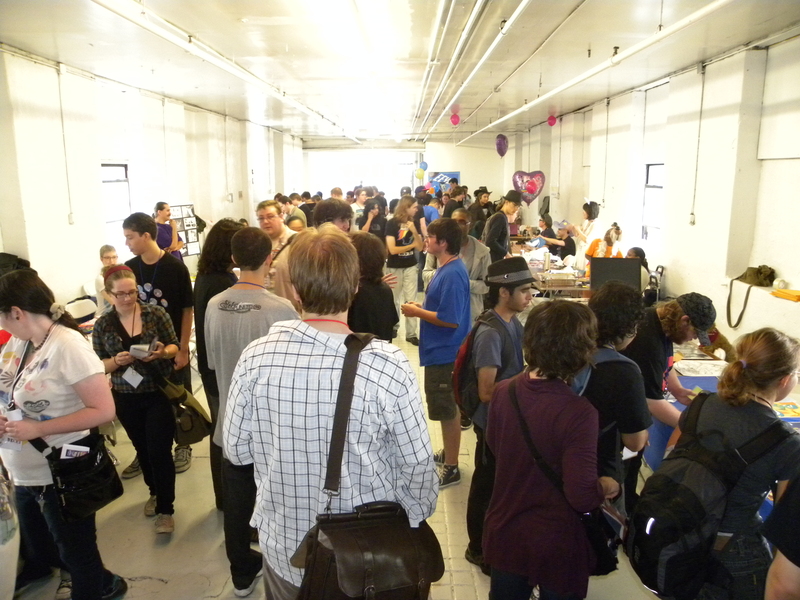 The con was held in a studio space above a textile factory on Eldridge Street, which was divided into three key areas.There were the vendors’ tables, where artists and collectors displayed their wares, a makeshift auditorium with hundreds of folding chairs where the con’s main events were held, and a small panel room that was home to the more specialized events, like artist’s demonstrations and a discussion about fan fiction. There was also a Texas Hold-Em tournament, a food service table, and an area where convention goers could mill around and talk, or have impromptu dance parties. The air up there was stifling, despite the fact that all of the windows were open. But the energy from the crowd of Bronies was palpable. Many of the people in attendance were decked out in pony regalia, and there were even a few people cosplaying as characters from the show. On my count, I saw three Pinkie Pies, two Raritys, a Twilight Sparkle, two Applejacks, a Big Macintosh, and even an Octavia. Perhaps the most popular costume of the day was everypony’s favorite equine DJ, Vinyl Scratch. 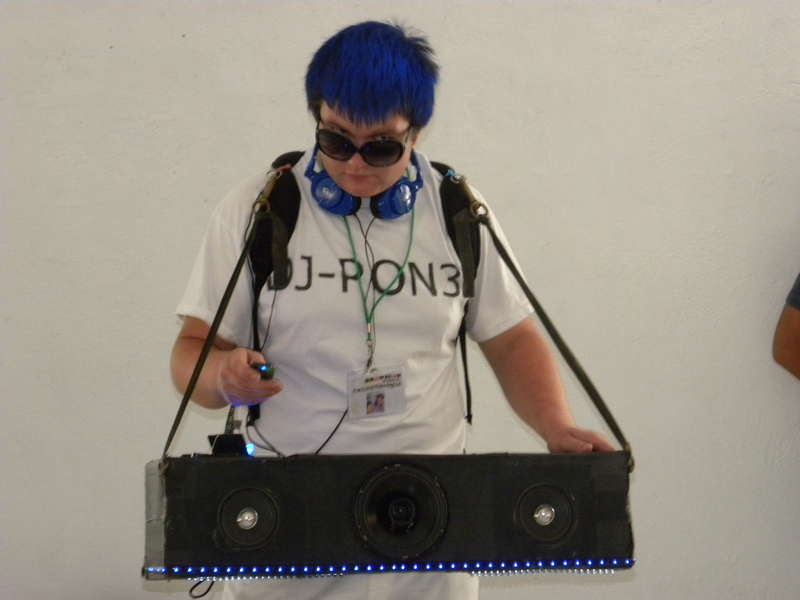 One dude dressed as DJ PON-3 even had his own portable DJ booth! A cosplayer dressed as DJ PON-3 at BroNY Con. The vendor’s section, also called Artist’s Alley, was replete with pony merchandise of all kinds: stickers, t-shirts, custom-made plushies, hand-drawn ponies, pins, and more. Egophiliac, one of the prominent comic artists in the community, was there to answer questions and sell artwork. There was even one vendor who offered a Cupcakes Pinkie Pie plushie, complete with her dress made of cutie marks and pegasus wings. Resisting the urge to spend money here was almost unbearable, but thankfully I had Erik with me, and he spent enough for the both of us. If I recall correctly, he purchased a t-shirt, ten stickers, an engraved thumb drive, and a pin, and he gave the woman with the Pinkie Pie plushie his email address so that she could make a custom design of his pony-sona. I managed to escape Artist’s Alley with only a pair of Spike and Rarity stickers, a real achievement, for sure. Perhaps the biggest event of the day was the screening and Q&A with director Jayson Thiessen, an experience that was within shouting distance of spiritual. Picture, if you will, more than 250 grown men and women, crammed into the sweaty confines of a downtown studio, all singing along with the opening theme song to “My Little Pony: Friendship is Magic,” having abandoned all pretense of adulthood and the anxieties that come with it. Now, picture them laughing in unison at the jokes, cat-calling and jeering whenever Discord, the villain, appeared onscreen, and applauding madly when Twilight Sparkle rediscovered the magic of friendship. Some people in the community have complained about the episode we were shown that day, calling it rushed and saying that the characters were poorly written, but I’ll always think of it as one of my favorites, if only because I saw it on a spike of adrenaline with hundreds of fellow Bronies. I can only imagine what must have been going through Mr. Thiessen’s mind during the screening, because he had an opportunity that probably doesn’t come up very often for people who work in animated television: the chance to see his work with a large, enthusiastic crowd. As the episode ended, nearly everyone in the audience got to their feet and applauded the hell out of it, and when Jayson took the mic to do the Q&A, we applauded the hell out of him, too. The makeshift auditorium, before the screening of "The Return of Harmony, Part 2"
The Q&A itself was, at times, tantalizing and embarrassing. Mr. Thiessen dropped a few hints about what we can expect from the second season, including the return of Princess Luna, more two-part adventure episodes, and new villains. He wasn’t allowed to divulge specifics, but he certainly left me excited to see what’s coming down the pipe. As much as I enjoyed the screening, though, I must say that the Q&A left me a little disappointed, because the audience only asked one or two really good questions. There were a few questions that kind of made me ashamed to call myself a Brony by virtue of their sheer geekiness. Much as in other fandoms, people get bogged down in the minutiae of My Little Pony. One guy with, shall we say, an interesting sense of humor asked where the ponies of Equestria get their glue. I don’t know if the folks who ran the con could have done anything to improve the Q&A, except maybe screen the questions ahead of time, but I suppose in this case, that’s more obvious in hindsight. Still, it was pretty interesting to hear Mr. Thiessen discuss his work on the show and the world that he helped to bring to life. I’m going to cut myself off now, before this post turns into a real behemoth. There’s still plenty more to discuss, as well as more pictures to show off, but it’ll have to wait for another time. I’ll try to get the second half of this reflection written up and posted in the next few days, so be sure to keep an eye out for it. NOTE: The second part of this article can be found here.